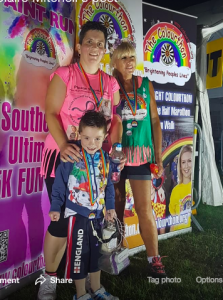 All entrants from Team PORT completed the Southend Colourthon walk this year. 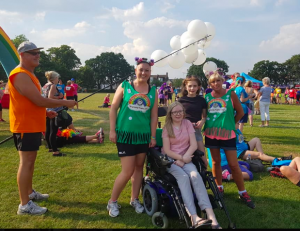 Everyone completed their walk at different times but it was the taking part that was most important to them all, a fun event, with a great Team spirit. Chairperson and Team leader Sue Stewart mustered a team of 23 walkers to take part on behalf of PORT. 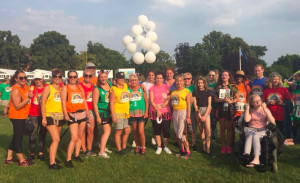 This gave the charity a good level of entrants compared to other charities, even some that are well known fielded a lesser number of entrants. 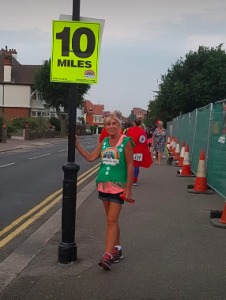 For Sue herself this was her 6 th Colourthon half marathon, supported by husband Barry Stewart (4th time) and daughters, Jessica Roskilly-Stewart, and Rebecca Stanier both 3rd time. Friends of PORT Clare Mitchell 2nd time, Team Debbie Callaghan 2nd time, and for their 1st attempt were Team Joe Smiles Team, Team Kaylie Finch’s Earl Grey Pub Team, and lastly Sam Smith who only signed up to walk the day before the event. As at the time of writing this £11,451 has now been raised from this event for PORT to fund research so a massive thanks to all those who took part, and their sponsors. An incredible amount big thank you from Sue, well done to all. If we are able to have more support next year who knows what we can attain in sponsorship, so get the word out to friends, and family to become PORT walkers in July 2019! The event is normally held on the first Saturday in July so pencil it in on your 2019 calendar now! Best wishes TEAM PORT – SupPORT the cause. PORT Charity raised £60,073 in our last financial year (31st March 2017). PORT funded £126,855 towards three projects. This is an amazing achievement for such a small charity. PORT has funded the EVASION research project looking at the effect of transcutaneous and physiological vagal nerve stimulation on symptoms and motility in patients with CIPO/Dysmotility. This project is on behalf of Prof Adam Farmer, University College Hospital, North Midlands and Prof Qasim Aziz Barts and The Royal London Hospital. The identification of CIPO subgroups with underlying connective tissue disorders and the assessment of GI Anatomy, motility and response to pharmacology in CIPO subjects using novel MRI techniques, Dr. Asma Fikree / Prof Qasim Aziz. A great year for #TeamPORT. Thanks everyone for all the support and fundraising efforts. Heres to another great year on our mission to help all that suffer! !